A 410-million-year-old soil shows extensive rhizome traces of Drepanophycus, an early vascular plant related to modern club mosses. Evolution and ecology are one and the same really because ecology is all about how species adapt and interrelate to form a complete system of interdependent organisms. Without evolution none of the interdependent organism could fit into their particular niche and compete with other organisms for resources. So, evolution created ecosystems and ecosystems drive evolution. But in the early days of life on Earth, before life emerged from the oceans where it had first evolved and diversified, there was no ecosystem as such on land, so how did the first emerging life manage to eke out an existence and what reason did it have to go there in the first place? Now scientists believe they may have found how an early plant, related to the club mosses, may have created its own ecosystem by interaction between its rhizomes and silt-laden floods. Rhizomes are underground stems by which many plants spread to form large colonies. Plants like this could have lived in shallow water prone to frequent drying so rather than them leaving the water, the water left them high and dry at times. It is but a small step then to spread out into 'dry' land prone to frequent flooding. The team found that early in the history of Earth’s terrestrial biosphere, a small plant called Drepanophycus, similar to modern club mosses, was already deeply rooted. This kept soils from washing away and even allowed build up as the resilient above-ground parts of the plants caught silt during floods. These plants – typically a metre long at most – helped form deep, stable soils where other plants could thrive. The roots and rhizomes of early vascular plants, and their interactions with soils, are poorly documented. 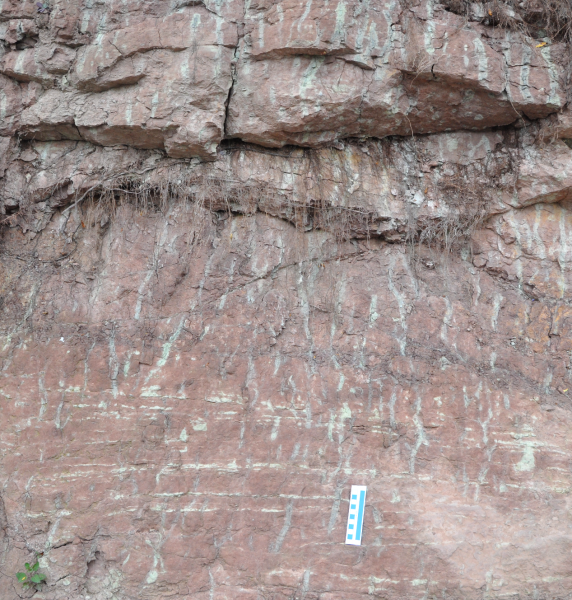 Here we report on the complex, belowground rhizome systems of an Early Devonian plant, and their contribution to the formation of the earliest record of rooted red-bed soils in Asia. Our specimens predate the earliest trees with deep roots from the Middle Devonian by 20 million years. We propose that plant rhizomes have long functioned in terrestrial ecosystems, playing important roles in shaping Earth’s environments by reducing soil erosion rates and thereby increasing the stability of land surface and resilience of plant communities. The interesting things about this find is that it is the earliest evidence of extensive vascular plant colonisation and even at that early time the root and rhizome structures were already well adapted being up to a metre long and penetrating deeply into the soil that they had probably help to create. This may have been the earliest formation of extensive flood plains onto which other life forms such as worms and arthropods could then move. It is also significant in that it is rare for plant remains in soil to be preserved this well. Soils is biologically active and subject to rapid erosion, so plant remains tends not to survive. Biologically this is interesting in that it shows how first plant, and then animal life could have colonised an otherwise barren land in stages, building and creating ecosystems as it did so. Imagine the struggle a dedicated creationist fraud or ID hoxer is going to have explaining how this find fits in with the daft notion that everything was created as is in a few days! Why are there no worms in the soil, no bones of mammals, reptiles or birds, no tree roots or flowering plants, in fact, nothing at all apart from traces of this primitive clubmoss, exactly matching how scientists believe the land was colonised and the order of evolution of the plants we now see. That's the things about evolutionary biology; newly-discovered facts like this always fit neatly into the scientific explanation like a hand into a glove, and they inevitably look completely out of sync with ancient creation myths based on the ignorant guesses of people who knew no better. This is why people who value truth and base their opinions on verifiable evidence don't agree with creationism.